There’s a moment during his conversation about athletes and activism at Harvard University’s Kennedy School of Government when Golden State Warriors forward Draymond Green seems to shift his weight. Green, who was in town to face the Celtics later that November night, has altered his game day routine to be at the lunchtime event, which was initially scheduled for a classroom, but had to be moved to a conference center when more than 500 students signed up. He takes the stage wearing high-top designer sneakers and a long-sleeved fishtail shirt. He folds his frame into a large wooden chair and fumbles with his microphone. “I wouldn’t pass up the opportunity to be speaking at Harvard. It’s like a dream come true,” says Green, before settling into his talk: Athletes should only champion issues they’re passionate about, he says. He discusses the pervasive tensions between young people and police, and the need to continue to educate himself about social justice. When a student asks for a response to those who say he should stick to basketball, Green leans forward, drawing closer to the crowd. It’s an opening for Green to issue a philosophical declaration, a Contemplation on the Nature of Athlete and Society, although more social media–friendly. “That’s funny,” Green says, after pausing a moment. “People say athletes shouldn’t speak politics. Well, I find that funny, because everyone thinks they can speak basketball.” The crowd erupts in applause. It’s an authoritative answer from a guy with a 7-foot wingspan, extending to his full proportions in a completely different arena. And it’s representative of what we’ve been watching the Warriors do over and over, in high-profile ways, during the past year. Black athlete-activists are not new, of course. Boxer Jack Johnson punched through racial barriers in the early 20th century, Jackie Robinson integrated baseball in 1947, Althea Gibson was the first person of color to win a grand slam title in 1956, and a dozen years later, Tommie Smith and John Carlos raised their black-gloved, black-power fists atop the medal stand in the Mexico City Olympics. In 2015, a protest by the Missouri football team over racism on campus forced the resignation of the university’s president, and the following year, LeBron James, Carmelo Anthony, Chris Paul and Dwyane Wade took the stage at the ESPY awards to urge athletes to speak out against injustice. A host of WNBA players, including Maya Moore and Tina Charles, have worn T-shirts supporting Black Lives Matter. But these were individual athletes fighting for a cause, or teams engaging on one issue over a limited period of time. The Warriors are something else entirely: They’re the NBA’s winningest team, in possibly the country’s most progressive market, with the most politically outspoken players and coach, during the most racially polarized period in two generations. It’s an evolutionary development in the power and influence of the American citizen-athlete, with commensurate risks to their reputations and livelihoods. (See: Kaepernick, Colin R.) The Dubs are not simply basketball superstars, they might just be the most progressive—the most woke—team in the history of professional sports. It was a morning in late September, one day after Warriors guard Steph Curry told reporters at the team’s media day that he’d vote to skip the traditional NBA champions White House visit, and Curry’s wife, Ayesha, was waking him up, laughing. “Trump tweeted about you,” Ayesha said. Suddenly, Curry, the family-friendly face of the franchise, was at the center of one of the year’s biggest sports and politics stories. His father, Dell Curry, is the all-time leading scorer for the Hornets. And while the family was well-off, Steph says he was always conscious of being black—and his obligations to the black people around him. He attended a small Christian high school; of the 360 kids there, maybe 14 were African-American. “We all sat at the same lunch table,” he says, “so we had a very tight community group that understood we were different in that space. I think we learned to protect that identity a little bit and celebrate it and have each other’s back.” And when he played AAU basketball with black kids from area public schools, he came to understand the differences in the worlds they inhabited—how some families struggled to put gas in the tank for an out-of-town tournament, but also that “we all had some common ground that we could appreciate about each other.” It was a figure-it-out-together quality, for the team, for the culture, that he took into adulthood. And though last fall’s Twitter firestorm was unusual because it pitted Curry against the president of the United States, it was only an extreme example of what many players on the Warriors are doing. 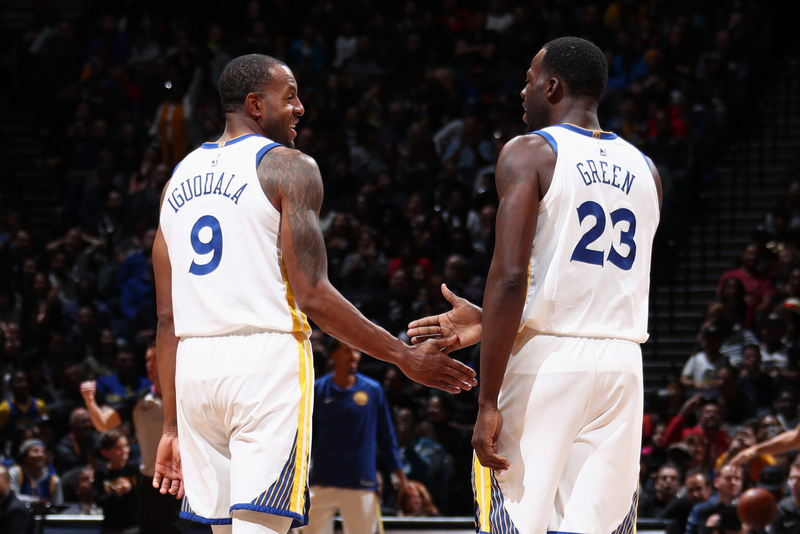 Draymond Green and Andre Iguodala high five during game. What gives them the cover and authority to stray so far and so publicly from the topics society typically wants to hear from people who play basketball for a living? One could say it’s their birthright as citizens to exercise the democratic mandates of civic participation and engagement in service of that foundational American imperative to form a more perfect union. But, sike nah. It’s all that winning they be doing. When winning athletes—let alone winning black athletes—question the validity of mainstream definitions, it sets up an acute civic dissonance. Kaepernick or Carlos or Mahmoud Abdul-Rauf become heretics and are punished as such. But the all-I-do-is-win-win-win Warriors have amassed so much cultural capital that they are not only worshipped, they’re widely heard. All that discipline, smarts, true-grit stuff? Their winning proves it works, Edwards says. But their activism challenges whether it works for people in Oakland and East St. Louis and the South Side of Chicago. The fact that they get to keep saying it is not only because they’re winning—it’s because winning in the Bay Area is a whole other thing. Some of that stems from Oakland itself. For more than half a century, Oakland and the Bay Area have been synonymous with the black consciousness movement, Angela Davis and the Black Panthers. They’ve welcomed the Free Speech Movement, anti-war protests and the Haight-Ashbury counterculture. The cities by the bay have been an incubator for gay rights, anti-fascism and Black Lives Matter. Sitting behind the baseline of Court One at their Oakland practice facility, Durant recalls the poor D.C.-area neighborhood where he grew up, noting the ways his head has changed in the time he’s traveled from there to here. “You can feel that culture when you get here,” says Durant, who signed with the Warriors in 2016 and was last year’s Finals MVP. As a child, he lived off Pennsylvania Avenue, “so you could drive 10 miles from the front of the White House … and you’re gonna run into where I grew up.” He knew where that street in front of his house led, who was living there and what it meant to be the head of state, he says, though he often tuned out all of those civics lessons, along with anything else that was happening off the court. 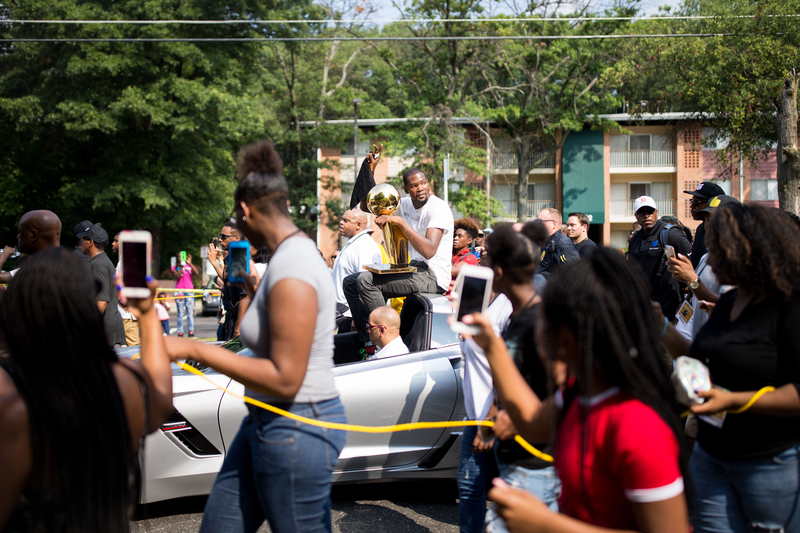 Kevin Durant waves to fans while holding the NBA Larry O’Brien Championship Trophy through the community that he grew up in Prince George’s County in Maryland. He calls his neighborhood 95 percent black with “80 percent of us living in poverty” and says he was so hell-bent on getting out that he turned a blind eye to the ways people were struggling to make it. It was a part of his soul he kept on ice, and he sometimes wishes he could tell his younger self to open his eyes and offer a little more hope and joy “to people who struggled, the way I struggled.” Because black joy is resistance. Before every practice or shootaround, the Warriors players gravitate to a group of 20 chairs in a corner of the gym near the weight room. Kerr stands in front of the group and talks about the practice plan, the upcoming schedule and other matters. Unlike most other NBA teams, “other matters” sometimes includes Trump’s latest tweets, the Alabama Senate election or the reign of the late Moammar Gadhafi in Libya. It’s a little Woke U in front of the TV where they watch game film, a spur-of-the-moment conversation guided by the events of the day and the passions of those who feel like speaking up. They share what they know and bookmark what they don’t for further reading after they change out of practice shorts and shirts. Kerr is part of a small contingent of white coaches with a reputation for being thoughtful and outspoken about race, politics and social justice. The group includes Spurs coach Gregg Popovich and former Bulls coach Phil Jackson, both of whom Kerr played for, as well as the Pistons’ Stan Van Gundy. “When I came here, I had a feeling that Coach Kerr was kind of open-minded about everything,” Durant says. “And I heard the organization was that way. But once you get into it and we talk about Trump winning the election before practice and before a game, and if we won a championship, what would happen—that stuff gets your mind thinking about what is going on outside the gym. Says West, a two-time All-Star: “Steve and I, when we interact, basketball’s like the last thing we talk about.” For years, without media attention, West has been engaged in his own demonstration during the national anthem. He stands last in line and a foot behind the rest of his team, in silent protest over issues of race, education, infant mortality and black life expectancy. 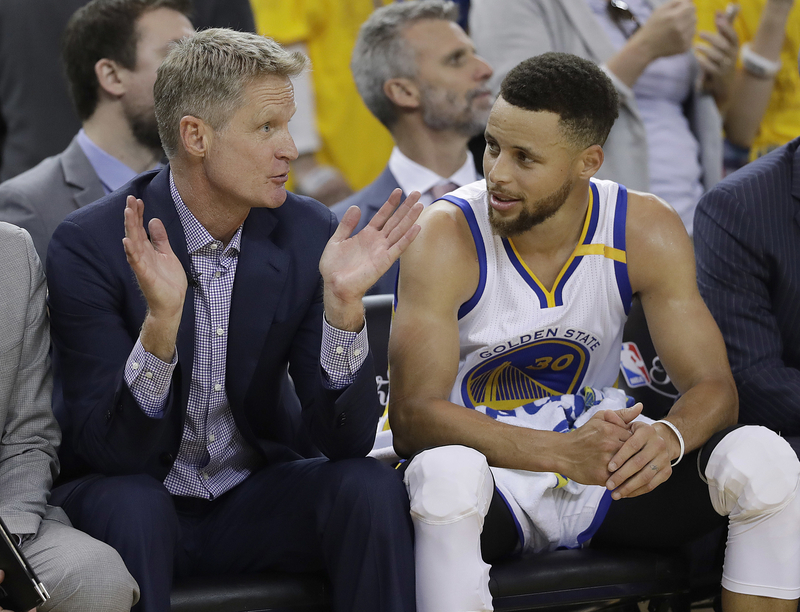 Golden State Warriors head coach Steve Kerr, left, talks with guard Stephen Curry during the second half of Game 2 of basketball’s NBA Finals against the Cleveland Cavaliers in Oakland, Calif., Sunday, June 4, 2017. The Warriors have just beaten the Mavericks 112-97 on a December evening, and Iguodala, who finished with two points but a game-high 10 assists, is standing at his locker. He’s talking not about the game but about the past, and the situational awareness he needs for the present and the future. “I know about people who grew up the way I did, and I know about their struggle and I know about things that are set up for them not to succeed,” says Iguodala, a 14-year veteran who grew up in Springfield, Illinois. This is the way life is set up, he tells his 10-year-old son: “You’re black, you’re an African-American man,” so you’ve got to be aware of your surroundings. It’s an era shaped by images of police shooting citizens, a video canon watched by players, who recognize that their own privilege and relative immunity doesn’t extend to people who look like them, or to anyone else they love. It’s an era in which fundamental national questions we thought had been asked and answered about race and equality are being re-engaged. It’s also an era in which athletes, especially in the NBA, have both financial power and the ability through social media to connect with millions worldwide. They can hit send without a coach’s or general manager’s permission, or third-party translation. Even Ali couldn’t spread his message without intermediaries. The times have both framed the issues and compelled the responses. Like the men and women who came before them, the Warriors are responding to what the moment calls for. Black-athlete activism began with the struggle for legitimacy, then access, then dignity and now power. And those struggles existed in a broader context. You can’t talk about Jackie Robinson and the integration of sports separate from the civil rights movement. You can’t talk about Jim Brown or Arthur Ashe without Black Power. And now you can’t talk about Kaepernick, the national anthem protests or the political levitation of the Golden State Warriors without the frame of the Black Lives Matter movement. When Green tied a critique of the word “owner” to the history of white men and slave labor, Mavericks owner Mark Cuban called on him to apologize. Green responded by saying, “I don’t expect him to understand. … He don’t know the feeling I get when I turn on the TV and see an unarmed black man got shot by a white police officer.” Those comments instantly became part of the national race conversation. But that, Kerr says, won’t always be the case. “The inevitable downturn will come,” Kerr says, “and when we’re not winning at such a high rate, maybe there will be a different reaction” to their words, to their positions on social issues and the athlete-activists publicly creating new forms of influence in America. The history will take care of itself. Researcher Martenzie Johnson contributed to this report.